Wikipedia is a central player in online knowledge production and sharing. Since its founding in 2001, Wikipedia has been committed to open access and open editing, which has made it the most popular reference work on the web. Though students are still warned away from using Wikipedia as a source in their scholarship, it presents well-researched information in an accessible and ostensibly democratic way. Most people know Wikipedia from its high ranking in most internet searches and tend to use it for its encyclopedic value. The Wikimedia Foundation—which runs Wikipedia—has several other projects which seek to provide free access to knowledge. Among those are Wikimedia Commons, which offers free photos; Wikiversity, which offers free educational materials; and Wikidata, which provides structured data to support the other wikis. Wikidata is a great tool to study how Wikipedia is structured and what information is available through the online encyclopedia. Since it is presented as structured data, it can be analyze quantitatively more easily than Wikipedia articles. This has led to many projects that allow users to explore data through visualizations, queries, and other means. Wikidata offers a page of Tools that can be used to analyze Wikidata more quickly and efficiently, as well as Data Access instructions for how to use data from the site. 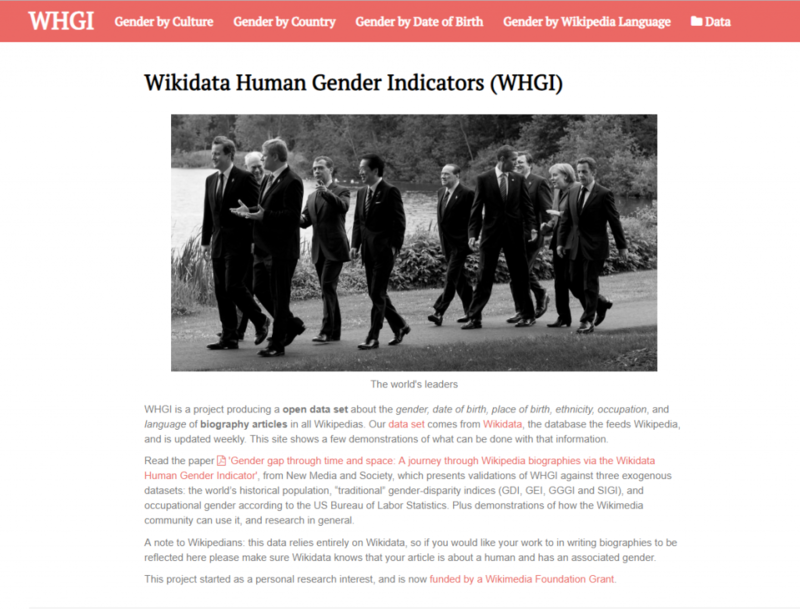 An example of a project born out of Wikidata is the Wikidata Human Gender Indicators (WHGI) project. The project uses metadata from Wikidata entries about people to analyze trends in gender disparity over time and across cultures. The project presents the raw data for download, as well as charts and an article written about the discoveries the researchers made while compiling the data. Some of the visualizations they present are confusing (perhaps they could benefit from reading our Lightning Review of Data Visualization for Success), but they succeed in conveying important trends that reveal a bias toward articles about men, as well as an interesting phenomenon surrounding celebrities. Some regions will have a better ratio of women to men biographies due to many articles being written about actresses and female musicians, which reflects cultural differences surrounding fame and gender. Of course, like many data sources, Wikidata is not perfect. The creators of the WHGI project frequently discovered that articles did not have complete metadata related to gender or nationality, which greatly influenced their ability to analyze the trends present on Wikipedia related to those areas. Since Wikipedia and Wikidata are open to editing by anyone and are governed by practices that the community has agreed upon, it is important for Wikipedians to consider including more metadata in their articles so that researchers can use that data in new and exciting ways. This entry was posted in Data Services, Data Source, Digital Humanities, Review, Tools and tagged Big Data, data, data source, Digital Resources, open access, open data, wikidata, wikipedia by Xena Becker. Bookmark the permalink.